I have been surprised at how most Egyptians I have met, seem so willing to have their pictures taken. I on the other hand, despite much argument to the contrary, do not much like posing. Here in the valley of the Kings sits a man who spends his day watching over tourists who line up, in endless long queues. He has probably had his picture taken countless times by frustrated tourists who are not allowed to take photos inside. I on the other hand am compelled by some strong journalistic urge to rebel against such signs of authority when there seems no clear reason not to do so. Of course there have been some obvious repercussions for this kind of laissez fair attitude. To my memory I have been arrested at least twice. I have never lost film in the ensuing incident. The walk down into the tombs is a preparation for the visitor. The life and deeds of the Pharaoh are inscribed in minute detail on the walls as you descend. If you have a guide they will point out this deed this bit of trivia, but after awhile it all begins to sound like noise. There may be crowds oohing and aahing around you but if you listen you can hear the silence here. Close your eyes for but a moment and the spiritual dimension of this enclosed cavern can open up for you. You can feel that you are in this most auspicious temple that opens to the heavens and not deep within the earth. I feel most people must feel this on some subtle inner level. They come by the millions to point and nod but their hearts are feeling something quite profound and silent. Of course they come for Tut. People have visions of Howard Carter laboring in the valley of the Kings and at last coming upon the golden treasure of the Boy King. Hints of that are here of course. But the golden masks are not. The boy King's body is still here, but does he rest. Is his peace intruded upon by those with hidden cameras. Who flaunt the rules and the signs saying not to steal his image. Our World Harmony run team had a more important mission today besides visiting the land of the dead. We met with some members of the young track team we had met with the day before. 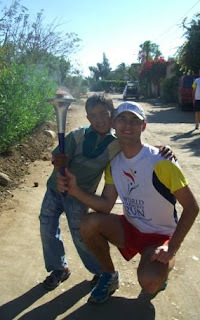 Here they run with the torch on the other side of the mountains from the Valley of the Kings. This is in front of the temple of Hatchepsout. The building is 3500 years ago the kids are very much current. Today we got a chance to spend time together and know each other better. We spend a better part of the day with the Kids. We tour some other sites and then all go off to lunch together in a little cafe by the Nile. This young guy is one of the owner's sons who was 8 going on 18. He like lots of kids that day just seemed to merge and become one with our little entourage. The World Harmony run is about finding an expanding community that is interested and cares about one another. Sometimes you have just a chance to pass the torch briefly. On this occasion we had nearly a day to spend with kids who's trajectory of their lives is much different than the kids who inhabit our worlds. Yet all hearts can meet and become one, despite the different worlds we inhabit, and the different languages we speak. After a day, the kids no longer look like the somber runners we had met with the evening before. They are singing for us their team song. Tomorrow they will be competing against other teams from the region. Who knows what they received from our brief visit. We three at least got to share a day with young hearts, and see vibrant youthful dreams. In this is, it becomes easier to see brighter futures for them, and, for us all.